We are distinguished manufacturer, exporter and supplier of impeccable quality Ceramic Radiant Infrared Heater. The offered ceramic infrared heater is manufactured using premium quality raw material and sophisticated technology as per the set quality standards. This ceramic infrared heater is rigorously tested on various quality parameters before delivering it to client to ensure high efficiency. In addition to this, we offer this ceramic infrared heater in various technical specifications at reasonable prices. The material used for the production does not oxidize therefore the surface always remains clean and do not wear out. As the coil is embedded in the ceramic material, it can be installed in any possible position. 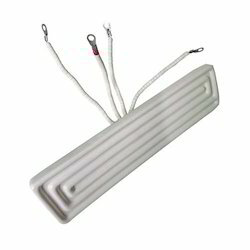 Looking for Ceramic Infrared Heater ?